This bread is baked to order with a minimum order number of 4. This rustic-looking stone-oven bread is made from 100% locally-grown whole wheat we have ground freshly in our zentrofan stone mill. We add brown and gold linseed, sunflower seeds and blanched almonds. We use only yeast as a raising agent. 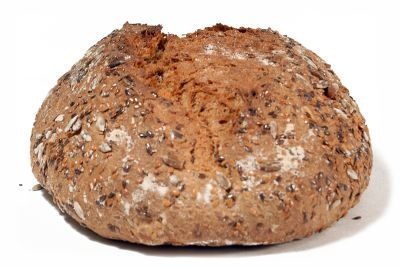 In fact our bread has a very short ingredients list; flour, water, yeast, salt and seeds! 100% wholegrain goodness and nutrition. No flour improvers, conditioners, preservatives, extra gluten or any other additives. Great as bread (when fresh) and very popular as toast, this bread is delicious savoury or sweet. It is also nutritionally balanced as it is, with the ideal proportion of fat, carbohydrate and protein. Available in two sizes, the popular 500g loaf, and the larger family-size 900g loaf.